Oconee County voters as a bloc will have less influence in the Georgia House of Representatives if redistricting plans released on Friday are adopted. Their influence in the Senate will remain largely unchanged. Oconee County voters now make up 59.8 percent of the registered votes in House District 113, but House and Senate redistricting committees have proposed that county voters be split starting in January between two House districts. Oconee County will make up only 22.1 percent of the registered voters in one of those districts and 49.8 percent in the other. 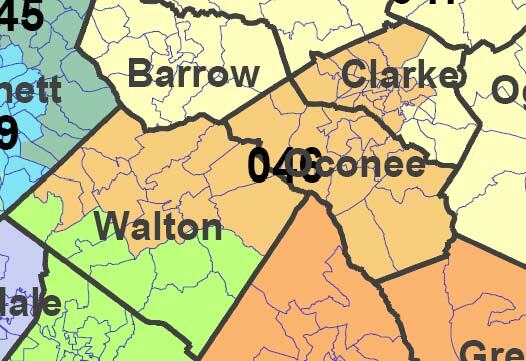 Oconee County voters are 22.0 percent of those registered in the current Senate District 46, which the county shares with parts of Clarke and Walton counties. The borders of that district will be shifted west, reducing the contribution of Clarke County voters and increasing those of Walton County voters. Oconee County remains the only of the three counties to fall entirely in the district, and 21.4 percent of the voting age population in the proposed new district would come from Oconee County. On Friday, the House and Senate committees released their proposals for the new boundaries of the 180 House and 56 Senate districts. The committees have not yet released their proposals for new congressional or Public Service Commission district lines. The General Assembly is scheduled to begin deliberations tomorrow in a session called to handle redistricting based on data from the 2010 U.S. Census. The state-wide maps released by the two committees for the House and the Senate are gross, and it isn’t possible to see precisely the lines of the new districts in them. The subcommittees also have released Google maps. I could not get them to launch, but The Atlanta Journal-Constitution has versions on its web site that show precise lines of the new districts. The committees also released voter registration data for the new districts. I compared the registration data for the new districts with data available on the Secretary of State site reporting precinct registration across the state as of Aug. 1, 2011. All of Oconee County currently is in House District 113, represented by newly elected Chuck Williams, a businessman in the county. The proposal released Friday moves three precincts from the north of the county–-Bogart, Malcom Bridge and Athens Academy--into the new 117th District. 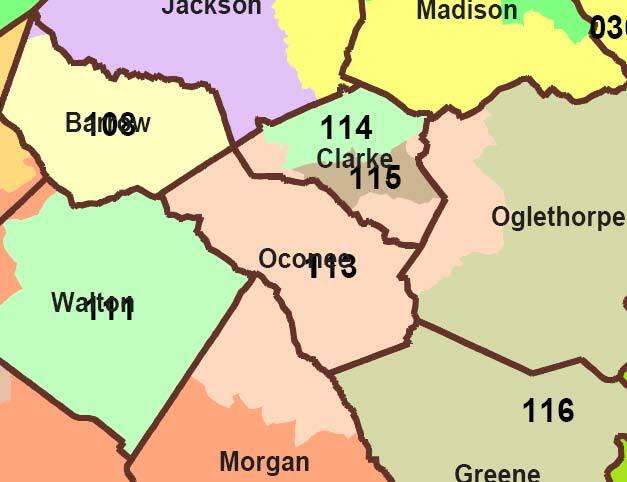 Parts of Clarke, Morgan and Oglethorpe counties also are in the current 113th District. In the proposal, the Morgan and Oglethorpe precincts are replaced with additional precincts from Clarke County. 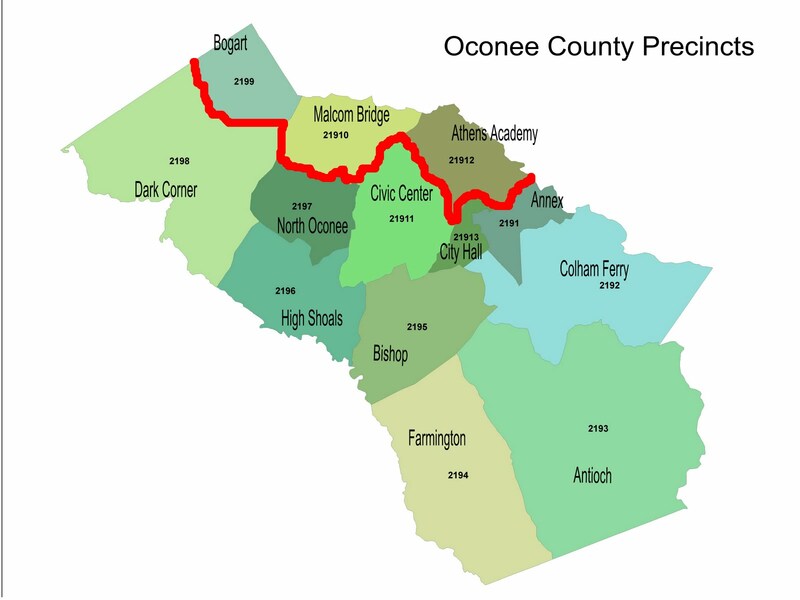 While the changes weaken the impact of Oconee County voters in the elections in both districts, they do increase the number of members of the House of Representatives who must pay some attention to Oconee County concerns. 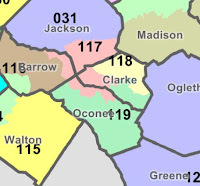 The consequence of the proposed changes in the House districts is that Clarke County would have only one intact district, the118th, and two partial districts, the 119th and the 117th. 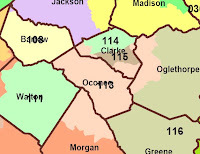 At present, two districts are entirely inside Clarke County and the 113th includes parts of Clarke. 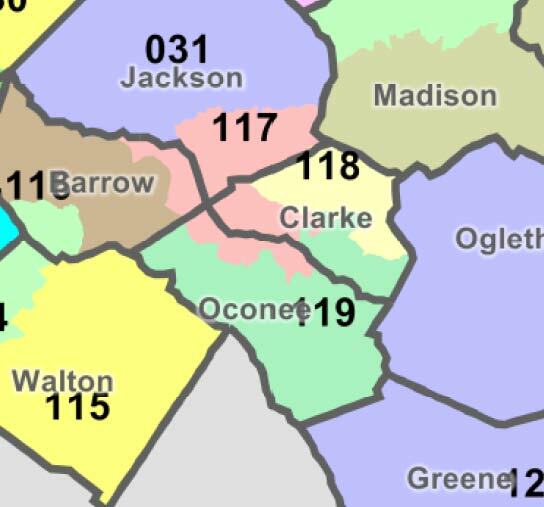 The proposed new 117th District will include parts of Barrow and Jackson counties as well as parts of Oconee and Clarke. 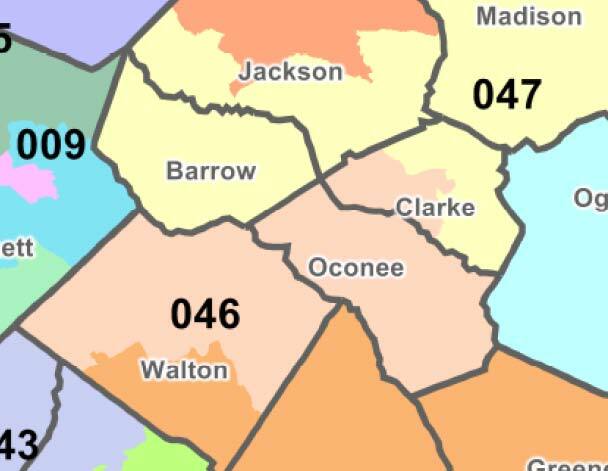 In Oconee County, the new districts have the effect of dividing voters rather arbitrarily. For example, subdivisions along the east side of Daniells Bridge Road would be in the 117th, while those on the west side would be in the 119th. I live in one of the subdivisions east of Daniells Bridge Road and would be in the 117th District. The primary beneficiary of the changes is Rep. Doug McKillip, currently representing the 115th District, now entirely in Clarke County. McKillip was elected as a Democrat in 2010 but switched to the Republican Party before the General Assembly session began this year. McKillip lives at 135 University Drive in Athens, according to his records on file at the Georgia Government Transparency and Campaign Finance Committee. The proposed new 117th District snakes around sufficiently to pick up that address. In the new map shown above, McKillip lives in the enclave just below the “a” in Clarke. Williams lives in the southern part of Oconee County and will remain a part of the proposed new 119th District. McKillip has been prominent in Oconee County in recent months, and I heard rumors in May about plans to create a new, more Republican district for him by adding parts of Oconee County, which historically votes Republican. According to the Journal-Constitution interactive map, voting records show that 57.2 percent of the voters in the new district voted for Gov. Nathan Deal, the Republican, against former Gov. Roy Barnes, the Democrat, in 2010. That is very different from the voting in that election in McKillip’s current 115th District. 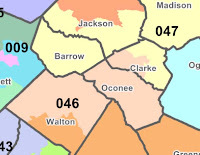 The current 115 District lines do not follow precinct lines in Clarke County in one case. Precinct 6c is split between the 113th and the 115th. I analyzed the votes of all 11 precincts that recorded a vote in 2010 for McKillip, when he ran unopposed as a Democrat. Deal got only 40.3 percent of the vote in the gubernatorial race, compared with the 57.2 percent in the proposed new district. The three Oconee County precincts that would be moved to the new 117th District help make it more Republican. Voters in Bogart, Malcom Bridge and Athens Academy precincts voted overwhelmingly for Deal in 2010, giving him 74.0 percent of their vote.